Hey guys, I know I’ve been gone for a few weeks. I had a new personal things to take care of, but now I’m back and ready to make more printables for you. Here is a February Monthly sticker set, I hope you like it. Expect Valentines Day stickers soon, also functional stickers and possibly printable die cuts! Lots of goodies coming very soon your way. Click the image for more info on this download or use the links below to get the files. Don’t forget to join my Facebook group to get exclusive printables, also for updates! Remember these printables are for personal use only. 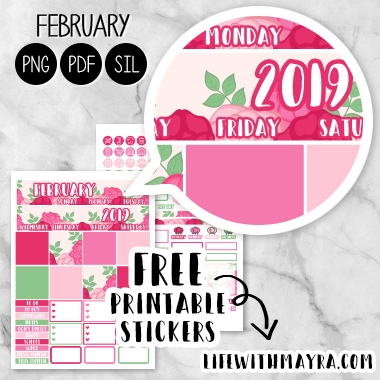 If you would like to share these printables please link directly to this printable page, not to the printable file itself.